Here’s what happened in Sunday’s game. Each PC gets 1,500 xp. Leaving Bax to guard the entrance, the Juma Gang head south to the troglodyte warrens. Spotting two nothics, Juma and Sora charge into combat, followed by the others. The one-eyed aberrations are frustrating opponents, using their dazing gazes to gain combat advantage, and retaliating when the PCs hit them. Eventually, both monsters are killed and the party search the troglodyte living quarters but only find baskets full of foodstuffs, although Hrothgar is very taken with the dried giant mushrooms and unidentifiable jerky. 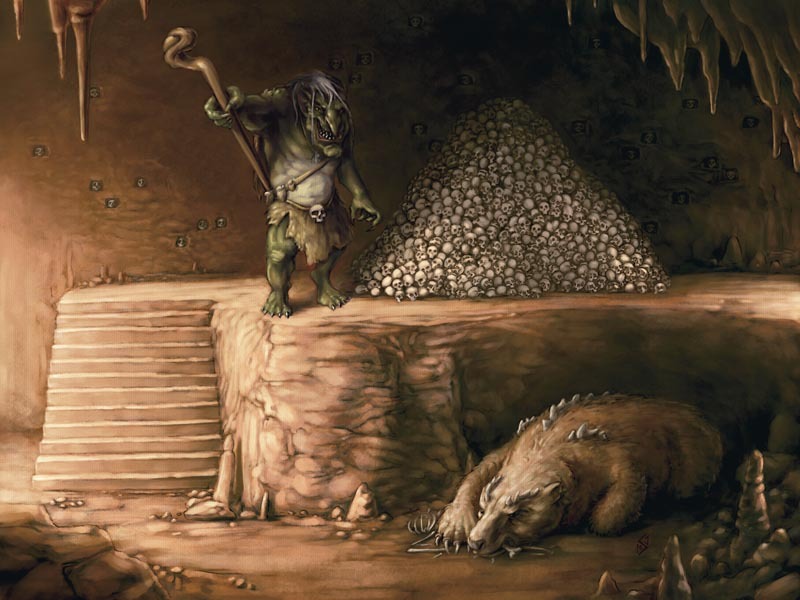 After Juma fails to pick the lock on the door to the south, the PCs (now accompanied by Bax again) go east instead, entering a cavern with a huge mound of skulls on top of a ledge. The skulls are tended by Norgg the troll vinespeaker and his dire bear companion. Norgg assumes the party to be mercenaries in Skalmad’s service and lets them pass. After following one passage back to the entrance, they return through Norgg’s cave and take the north east tunnel. There is some discussion amongst the Juma Gang about whether to try and negotiate, or to just shut the door, but hot heads prevail as Gil casts an acid resistance spell on everyone and Hrothgar leaps across the lake to attack the dragon. The gnoll is joined by Sora in the front line as Ulthar floats over the water using his cloak of shadow form. Caught in Gloomfang’s shroud of gloom, the trio’s protection from acid is cancelled out and the paladin and the barbarian are both bloodied by the dragon’s terrible claws and bite. As Juma and Bax arrive to help, Sora falls unconscious after being struck with a tail sweep and then a double claw attack. Things get worse once Gloomfang is bloodied – every time the dragon takes damage it sprays the PCs with acidic blood and it continues to strike back with its tail at melee opponents. Ulthar, who has resumed his corporeal form and taken Hrothgar’s place in the front line, takes 60 hp damage in a couple of rounds. The party’s attacks, though, are slowly but surely hurting Gloomfang, and the dragon seizes the opportunity to dive into the water and make its escape. The PCs search the dragon’s nest, finding gold, gems and jewellery as well as a +3 mordant longsword named Scourge of Vardar. Juma rejects the blade, giving it to Gil to brandish above his head. The mage soon realises its ability to deal acid and poison damage could come in very handy against the trolls. Needing to recover from the battle, the PCs have an extended rest in the cave. Heading south from the dragon’s den, the PCs enter a collapsed cavern, its ceiling open to the sky above. Here, they fight three more nothics and three warren trolls. When the first two trolls are killed, the third one flees, leaving the nothics to their fate. After the battle, the PCs can hear cries for help coming from the chamber to the east.